Somewhere in the Middle East, an evil cult summons a demonic creature named Animus from places beyond. Now free to travel the world of Man once more, Animus sends his spirit south to Jerusalem, where the Dead Sea Scrolls are kept. Breaking into their shrine, he steals the “scroll of the war of the children of light and the children of darkness”, alternatively known as “the end of days”. With it, Animus shall know everlasting victory. At an airport in Jerusalem, April and Oyuki finally make it through customs and hail a cab. Apparently, the footage they shot of Wyrm, Scumbug and Toxzeem earned them a gig covering an interfaith convention centered on religious tolerance. After having the bellhops lug their multiple (humongous) trunks up to their room, they unpack… the Turtles, Splinter and Ninjara! Finally able to breathe again, the mutants immediately have to hide as the room is visited by a member of Jerusalem’s military, Private Ariella Yahuda. She has been assigned to act as April’s guide/babysitter while she covers the conference. April isn’t thrilled about it, but has no choice. Once Ariella leaves, the Turtles and Ninjara engage in a rousing pillow fight while Splinter turns on CNN. They’re met with a horrible sight: everyone in the streets of Jerusalem has gone berserk, breaking out into mob violence over matters of faith. Making things worse, two monsters have joined the brawl: Katmandu and Al-Falqa. April and Oyuki attempt to check the situation out, but Ariella refuses to let them leave their room. The Turtles, however, sneak out the window. 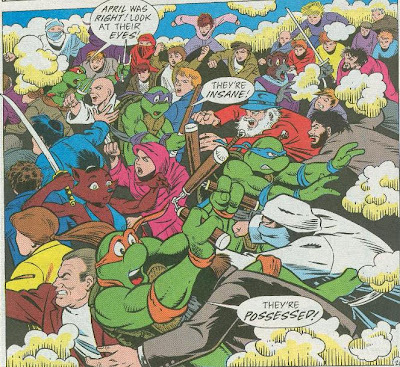 Down in the streets, the Turtles, Spliner and Ninjara are besieged by a mob of mindless, possessed people. They try to quell the zombies without hurting them, but the presence of skilled bruisers like Katmandu and Al-Falqa (also possessed) only makes things worse. Suddenly, one of the rabble throws a Molotov Cocktail into a nearby car and Michelangelo gets caught in the explosion. As he lays unconscious, the spirit of Animus hovers above him, laughing. Elsewhere, Private Ariella decides that the situation has left her no choice. Transforming into a scaly, blue-skinned creature, she declares that she must call forth the powers of Golani. On his new island home in the Caribbean, Slash reflects on his lost homeworld, Palmadise, and how his new homeworld is so similar. Not far away, on Mutani-Isle, Mondo Gecko and Candy watch a passing meteor shower, getting all romantic. Inside the volcano HQ, the other Mutanimals use their state of the art computers to try and dig up information on the foursome that recently attacked them. Man Ray suggests they use their satellite monitoring system to try and track them down. Suddenly, an emergency alarm goes off in the base. One of the meteors from the shower overhead has made it through Earth’s atmosphere unscathed and crashes on the beach of Mutani-Isle. Seeing the explosion from a distance, Slash thinks that his new homeworld is under attack. Enraged, he leaps into the ocean, swimming straight for Mutani-Isle. 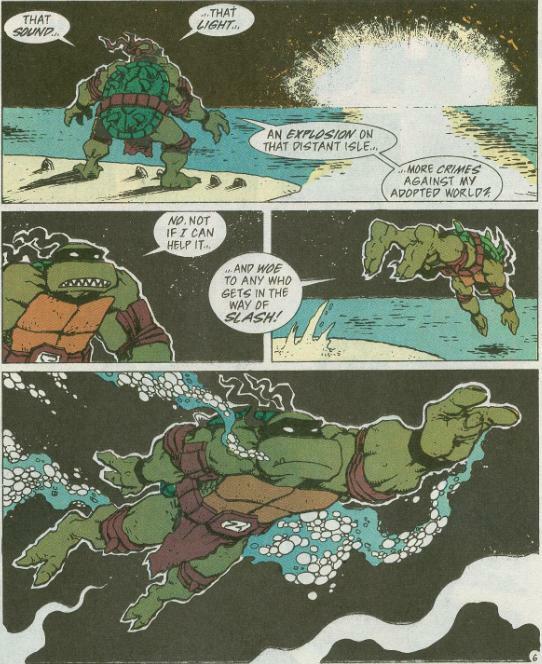 *This story is continued from TMNT Adventures #52. 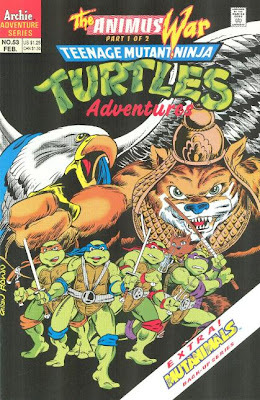 The story continues in TMNT Adventures #54. *Katmandu last appeared in TMNT Adventures #34 while Al-Falqa last appeared in TMNT Adventures #36. *Slash last appeared in Mighty Mutanimals #9. *Mondo Gecko and Candy were reunited in Merdude and Mondo Gecko #2. It’s funny what Murphy (Clarrain) has been doing with these last bunch of issues. Basically, he’s been bringing back all the mutants and plot-points that appeared in earlier storylines pretty much in the order they were originally introduced. First he brought back the Eyes of Sarnath, then Stump and Sling, then Codename: Chameleon, then Wyrm and Scumbug, now Katmandu and Al-Falqa. It’s sort of a nostalgia rush for the book, even if characters like Katmandu and Al-Falqa have only been out of the picture for two years or so. 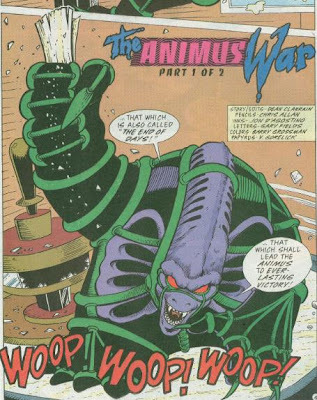 What’s funny about this first installment in “The Animus War” is that I don’t really care about the prologue with the Hellish deity or the cliffhanger with the unruly mob that bookend the issue. I just really, really enjoy all the stuff in-between; April and Oyuki sneaking the Turtles into their hotel room, then everybody goofing off and having a good time. It’s fun and leisurely and cute. I’m also grateful to see April and Oyuki back in the picture for an extended period of time. Allan puts so much style and energy into April’s appearance and expressions, too. 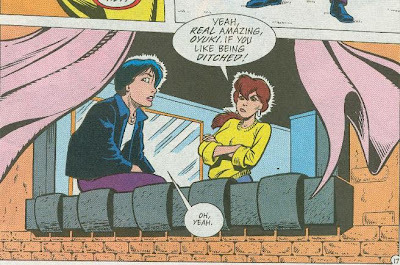 A lesser/lazier artist would simply draw April in the same outfit and hairstyle in every issue, but Allan realistically changes up her wardrobe between appearances as well as her look (she has a ponytail and a Yankees cap in this issue). Oyuki is still wearing her usual leather jacket and t-shirt ensemble, but I think that works for the tomboyish character. Though it’s only been touched upon so far, “The Animus War” is setting foot in some territory that would be considered pretty dangerous in today’s international climate; namely, the hostilities between Palestine and Jerusalem. Not that it wasn’t a hot button issue in 1994, but considering just how bad things have gotten in the past 18 years, no children’s comic would ever “go there” now ‘n days. In a way, it’s both impressive and depressing; that a kid’s comic from ’94 would dive into such volatile political waters, but that the situation in reality has gotten so sensitive that it’s become genuinely dangerous to even discuss it publically in some circles. 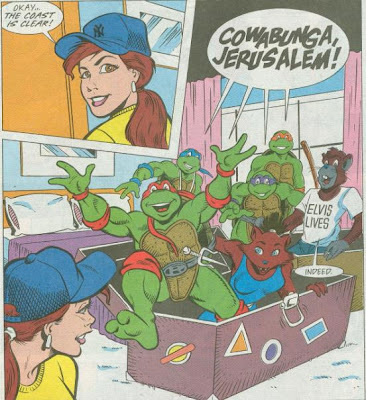 Then again, TMNT Adventures once published a drawing of Muhammad and it didn’t end with the Archie and Mirage offices getting carbombed into the ground, so I think we’ve already established how far Western and Middle Eastern societies have deteriorated in regards to religious tolerance. Back to the subject of “The Animus War”, this is all just a lot of set-up but I found the middle section very light and amusing. Allan rocks some great pencils and D’Agostino’s inks look really sharp. I also enjoyed this issue's lighter moments. It's sobering that they occurred in the context of such real-world problems. Sadly, those problems can't be solved by four mutant turtles defeating an ancient monster. And, yes, I've always liked the look Allan gave April in this issue. It's the only time I can remember him drawing her in a lengthy dress, and it's a good look for her. However, nowadays I think that Yankees hat would be perceived as "arrogant Americanism."